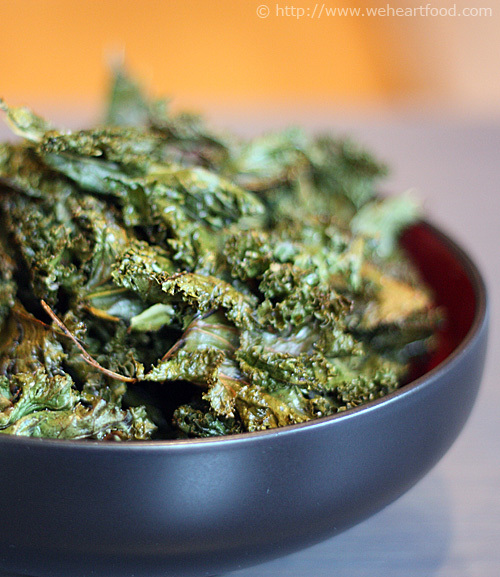 How to eat your vegetables: Kale Chips! I’m surprised that it took almost two years for these to show up on the blog, since we make them so often. It’s a great way to use up the bunch of kale that showed up in your CSA that you forgot about, or when trying to convince someone that he’d actually like the stuff. These end up as crispy, dissolve-in-your-mouth treats that you can season to your liking. Lately we’ve been using Penzey’s Northwoods Fire seasoning blend, which gives it a nice kick. The kale will shrink a bit when it bakes, so don’t worry if your “bite size” pieces start out bigger than a bite! Start making bets with friends that you could get them to eat an entire bunch of kale, willingly, in one sitting. You will win. salt, pepper, or whatever spices you like! Tear the kale off the thick stems and into bite-sized pieces. Rinse and spin-dry the kale, then toss with the olive oil, cider vinegar, and spices of choice until well coated. Place on a parchment-lined baking sheet and bake for 10-12 minutes or until crispy and just starting to brown. Watch carefully because they can go from done to burned in no time. Remove from oven, put in a bowl, and inhale. Visually appealing? Perhaps not so much, but this soup we adapted from Elise’s Simply Recipes was simply delicious. The roasted vegetables give the soup a nice depth, and we always heart kale! Lisa’s dad had never tried kale before, so this was a good introduction to this superfood. Yum! This smells really good. Were you putting extra garlic in there? Heck yeah — in addition to the six cloves the recipe called for, I threw in 6 whole roasted garlic cloves at the end. So you might encounter delicious little flavor gobs. There’s 12 cloves of garlic in here? You really can’t taste it; it’s not overpowering at all — what’s hiding it? Maybe the sweetness from the squash? Also, the garlic cloves are roasted so they’re a lot mellower than usual. Oh, I forgot, you may not like the squash… it’s sweet. What do you think of kale? It really didn’t. You spend a lot of time waiting for the veggies in the oven, but actual preparation time is pretty short. I love soups on days like this when it’s cold and rainy outside! Preheat oven to 400°F. Drizzle a baking sheet with a little olive oil. Arrange carrots, squash, tomatoes, onion, and garlic on sheet. Drizzle with more olive oil. Sprinkle with salt and pepper. Toss to coat. Roast vegetables until they are brown and tender, stirring occasionally, about 45 minutes. Place garlic cloves (remove papery skin), tomatoes, and onion in a food processor and puree until smooth. Add the puree and the vegetable broth, the kale, oregano, and bay leaf to a large dutch oven. Bring to a boil, then reduce heat. Simmer uncovered until the kale is tender, about 30 minutes. Meanwhile, cut squash and carrots into 1/2 inch pieces; set aside. 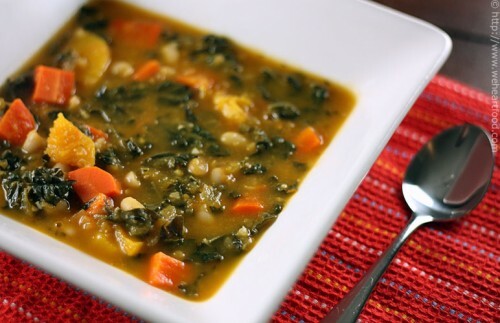 When kale is tender, add carrots, squash, and the drained beans to soup. Simmer 8 minutes, adding more broth to thin soup if necessary. Season with salt and pepper. Discard oregano and bay leaf. We found this easy, tasty recipe in Moosewood Restaurant Low-Fat Favorites: Flavorful Recipes for Healthful Meals . There’s only 1/2 cup of evaporated milk in the final dish, but that little amount gives the soup a nice richness. The kale, green onions, dill, and leeks add eye-catching green highlights to the dish. I hate taking pictures of soup. They never come out looking as appetizing as I hoped… at least stews have some texture to work with. Well, whatever… you keep worrying about the picture, I’m gonna start eating this soup before it gets cold! I’m done anyway… I love the kale in this soup. Me too! 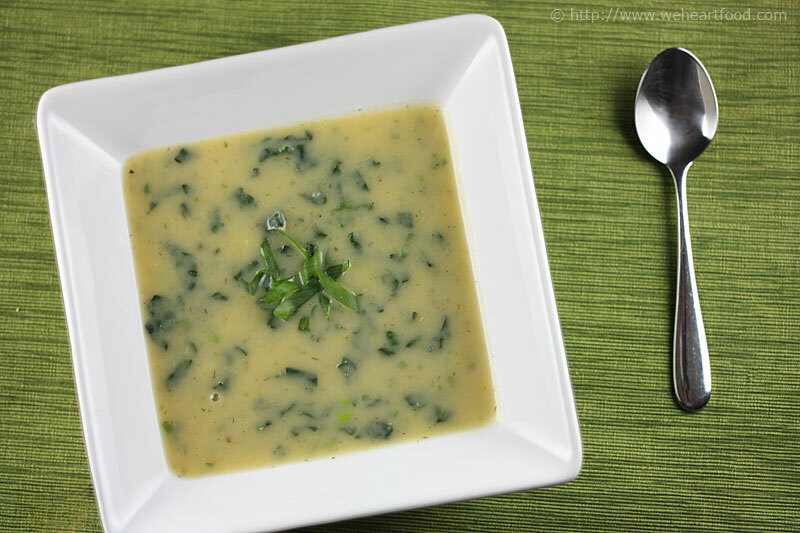 This broth is really creamy from the pureed potatoes… for being low-fat, it’s actually pretty filling. I think the key to this one is the Dijon; it gives it just a little bit of tang, but it’s not overpowering. Yeah I wouldn’t have even known it was in there. Mmmm… I’m enjoying this so much that the whole picture thing doesn’t really bother me any more. See? Don’t worry about it… I’d rather have food that tastes better than it looks than the other way around! In a large dutch oven, sauté the onions, leeks, and salt in the oil on very low heat for about 7 minutes, until tender and translucent. Add the stock and bring it to a boil, then add the potatoes, fennel, celery, wine, and dill. Simmer for about 20 minutes, covered, until the potatoes are tender. Use an immersion blender to puree the soup until smooth. Stir in the mustard, scallions, basil and evaporated low-fat milk. In a separate pot, gently boil the kale in just enough water to cover. When the kale is just tender, drain it and stir it into the soup. Add salt and pepper to taste and lemon juice. Reheat the soup until it is very hot, but not boiling. This was another of those “let’s look for a recipe that uses the veggies in the CSA box” nights that turned out really well. 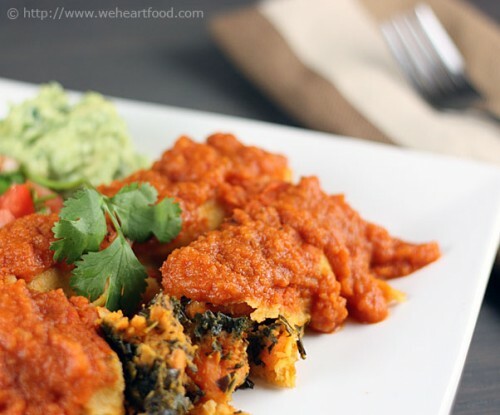 The original, in Veganomicon: The Ultimate Vegan Cookbook called for red or yukon gold potatoes, but we had sweet potatoes on hand and I thought they made a nice contrast to the spicy homemade enchilada sauce. Well they certainly love giving it to us in the CSA box… not that I’m complaining. Anyway, what do you think? I like it — I didn’t think I’d like the sweet potatoes, and I still want to try this again with regular spuds, but the taste is really good. What do YOU think? I think it’s hard to take a good picture of enchiladas. Hmmm…. don’t worry about it. I think people know enchiladas aren’t that photogenic. Maybe. Anyway, I love these things. I’d probably puree the enchilada sauce a little more next time, but I like the combination of flavors. The guacamole you made goes really well with it too. I heart guac. I’m really liking the recipes from this book. They certainly don’t scream “vegan”. I agree! They’re just good. Peel and diced the potatoes, then boil them until tender, about 20 minutes. Drain and set aside. Preheat the oven to 375°F and have ready a shallow casserole dish, at least 11 1/2 x 7 1/2 inches. Prepare the enchilada sauce : In a large, heavy-bottomed saucepan over medium heat, sauté the onions is oil for 4 to 7 minutes, until softened. Add the remaining sauce ingredients, bring to a simmer, and remove from the heat. When the mixture has cooled enough, taste and adjust the salt if necessary. Puree with an immersion blender until the mixture is smooth and even. Prepare the filling: Cook the olive oil and minced garlic in a saucepot over medium-low heat, stirring occasionally until the garlic is sizzling and slightly browned. Add the kale, sprinkle with a little salt, and raise the heat to medium, stirring constantly to cover the kale with the oil and garlic. Partially cover the pot to steam the kale until it has wilted, 4 to 6 minutes. Remove the lid and mix in the potatoes, vegetable stock, lime juice, and salt. Use the back of a wooden spoon to mash some of the potatoes. Cook another 3 to 4 minutes, until the stock is absorbed. Add more salt or lime juice to taste. Ready a plate filled with about 3⁄4 cup of enchilada sauce, a casserole dish, a stack of corn tortillas, a heated cast-iron pan, and the potato and kale filling. Ladle a little bit of the enchilada sauce onto the bottom of the casserole dish and spread it around. Take a corn tortilla, place it on the heated pan for 30 seconds, then flip it over and heat until the tortilla has become soft and pliable. Drop the softened tortilla into the pie plate filled with sauce; allow it to get completely covered in sauce, flip it over, and coat the other side. Now, place the tortilla in the casserole dish, place some of the potato filling down the middle and roll it up. Continue with rest of tortillas, tightly packing enchiladas next to each other. Pour about a cup of sauce over the top (reserving some for later), cover tightly with aluminum foil, and bake for 25 minutes. Remove the foil and bake for another 10 to 15 minutes, until edges of the tortillas poking out of sauce look just a little browned. Allow to cool slightly before serving. Top individual servings with any remaining enchilada sauce, warmed slightly. Lisa spotted this everything-but-the-kitchen-sink quinoa recipe over at 101 Cookbooks, where it’s titled “Heather’s Quinoa”. We’re glad that Heidi decided to post this mish-mash, we both really enjoyed all the different tastes and textures. We had a small block of Gruyere left in the fridge, so we also invited that little guy to the party. Holy; what *isn’t* in this quinoa? Not much, isn’t it awesome? Yeah — I like all the surprises. Also, it’s surprisingly filling. I’m sure the biscotti we’ve been eating all afternoon contributed to that. Well, we’ll have to make it at least one more time then! Roast the cherry tomatoes: Heat oven to 350F degrees. Cut each tomato in half and arrange in a large oven-proof baking dish. Add a splash of olive oil, a spoonful of brown sugar, and some few pinches of salt, and pour over the tomatoes. Toss to coat the tomatoes, and flip them so they’re cut-side up. Place in the oven and bake for 45 minutes, until the tomatoes look shrunken and delicious. 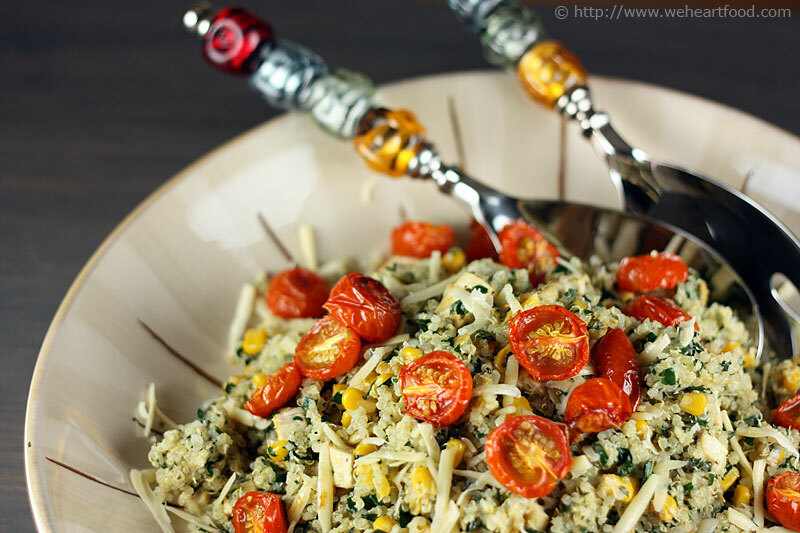 While the tomatoes bake, rinse the quinoa in a fine-meshed strainer. In a medium saucepan heat the quinoa and 4 cups water until boiling. Reduce heat and simmer until water is absorbed and quinoa fluffs up, about 15 minutes. Quinoa is done when completely tender. Drain any extra water and set aside. In a dutch oven heat the olive oil and salt over medium-high heat. Stir in the shallot and cook for a minute or two. Add the quinoa and corn and cook until sizzling. Stir in the kale and the tofu, cooking until tofu is heated through. Remove from the heat and stir in the pesto and pumpkin seeds. Stir until the pesto is well incorporated. Transfer onto a platter and top with the shredded Gruyere and cherry tomatoes.